The batán is a large stone for grinding and milling commonly used in southern South America. My grandma has been using the one pictured above for the last 60 years, and in her house in Peru it’s a must-have for many of the dishes she prepares. Wikipedia has an incomplete entry for it here and a much better one in Spanish here. Basically it’s just two rocks — one large flat rock at the base and a smaller, rounder (or oval) rock which is used to crush or grind the ingredient between the two. It’s like a large version of a mortar and pestle. One would think that a food processor could easily replace it, but according to my grandma, the taste and texture of the result is completely different. The batán is used to grind all kinds of ingredients. It’s used to crush corn and cilantro for green tamales, and huacatay combined with aji amarillo for aji de huacatay. If you gave my grandma the choice of using an electric coffee grinder, or the batán, she’d grind her beans with the batán every time. Since I don't have one of these in my Tulsa kitchen yet, I’ll try to improvise and update this post to let you all know what worked for me and what didn’t. This is one of my favorite prepare-and-forget dishes, because the prep time is, at most, 15 minutes. The crockpot does the rest. It’s a dish that can be slow-cooked for 6 to 8 hours. I’ve been making chili in crockpots for years now, but this is a recipe I got from my brother when I went to Columbus for Thanksgiving week last year. The secret ingredient is cilantro as a garnish, but I know people either love cilantro or hate it, so it is optional. It’s also the first time I’ve had garbanzo beans in chili (now I’m addicted to it) so I guess there are really two secret ingredients. The picture above was taken with chili I made with beef. The intent was to use ground turkey, but I defrosted the wrong meat so I used that instead. Chili makes for excellent leftovers. In fact, I sometimes think the chili tastes better after a day or two in the fridge. You can even use it to make Frito pies or chili dogs. I also make chili completely from scratch. I’ll share that recipe with you in the future. Dice the onions, garlic and the jalapeño. Add these to the bottom of the crockpot, then add the raw beef or turkey and about 3/4 of the spices and the can of stewed/diced tomatoes. Stir a couple of times then cover and cook for the first 3 to 4 hours on high, then turn the heat to low and add the rest of the spices and the beans. Cover and finish the cooking; if you have time, stir it occasionally. About 30 minutes before the chili is done, add about half the green onions. If the consistency after cooking is too runny, add about 2 teaspoons of tomato paste to thicken the chili. If you like cilantro as much as I do, use it as a garnish to get a whole new twist to the chili flavor (one I’ll be using for years to come). Whether or not you use cilantro, top the chili with remaining green onions. Other fun toppings are cheese, croutons and sour cream. I usually serve my chili on rice, but you can just serve it in a bowl. Lomo saltado has to be one of my all-time favorites. Maybe it’s the way the meat is marinated, or the seasoning (or even the fact that the dish includes fries) but one serving is never enough. The dish itself is not all that complicated. The type of beef you use depends on how much you want to spend, as long as the beef can be cut into 1½-inch thin strips. The only thing that takes time is chopping and cutting the ingredients and frying the potatoes (and the dish actually works well even without fries). Everyone in my family has his or her own way of preparing lomo saltado (also commonly known as saltadito — at least in my family). For example, my aunt who lives in Peru leaves off the potato and adds several other vegetables. My mom here in Tulsa adds the fries only part of the time, and she also spices the dish in a different way. Cut all the vegetable ingredients and separate them into individual bowls. Cut the tomatoes into wedges, the onions into thick slices and dice the aji amarillo, then peel the potatoes and cut them into french-fry-size pieces. Combine the onions, tomatoes and garlic into a large bowl and marinate them with the vinegar, oil, 1 tsp soy sauce, salt, pepper and about 1/4 tsp cumin. Cut the steak into 1 1/2 inch strips, about 1/4 inch thick. Rub a little salt, pepper, 1/2 tsp cumin and aji panca on the meat, and sprinkle about half the red wine vinegar and 1 tsp of soy sauce. Set this aside for a few minutes. If you’re serving fries with this dish, I recommend preparing them first (along with the rice) since it’s best to serve the meat soon after its cooked. For the fries, pour about 1/4 to 1/2 inch of vegetable oil in a pan (its not necessary to completely cover the fries in oil) and turn it to medium high. After a few minutes, take one of your potato strips and dip the tip into the oil; if it sizzles, then it’s hot enough. Put the potatoes in, one layer at a time, and use tongs or a fork to turn them until they’re crisp on all sides and fully cooked through. Dry them on paper towels and set aside while you prepare the rest of the dish. Coat a large pan with about a tablespoon of vegetable oil and set on high heat. When the oil starts smoking, drop the meat in. Stir constantly until the meat is brown on all sides. When you can’t see any more red on the meat, transfer it to a bowl. Into the pan you just emptied, place the marinated onions, tomatoes and garlic; saute about 3 or 4 minutes. Drop the meat back into the pan and lower the heat to low. At this point, the meat and veggies don’t need to cook longer, just kept warm until serving time. Mix the fries with the meat and veggies, or just place them on top. I like it both ways. Put a healthy mound of rice on a plate and then ladle the saltadito on top or to the side of the rice. I prefer to put it on top so the rice can absorb some of the veggie and meat juices. If you mixed the fries with the saltadito while in the pan, you’re done. If not, add a few on top. Enjoy! Recipe cooked on 2011-02-13 (Lima, Peru). Photographs by Michael Findley. This has to be one of the most essential ingredients in Peruvian cooking. It’s used in popular dishes like papa a la huancayina, ocopa, tamales verdes, oyuco, aji de huacatay, causa rellena and ceviche. It’s not really a very hot pepper, but it’s packed full of flavor. This pepper can be stored dry and reconstituted before use (although this method will limit the number of dishes in which it can be used). 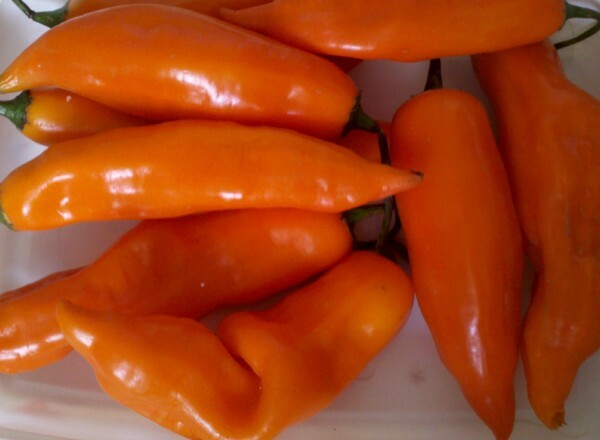 According to food.com, aji amarillo is a chili pepper like aji panca. Amarillo is “yellow” in English, although it turns a bright orange when it’s ripened. I’m adding this post because several of the dishes I’ll share on this blog use aji amarillo. I have yet to find aji amarillo at any of my local grocery stores here in Tulsa, but both Amazon and ebay sell them. I recently purchased an aji amarillo plant through Amazon. I’m really excited about growing this in my own backyard, and I’ll let you know in a few months if it’s still alive. I planted my aji amarillo peppers back on the 26th of April. I was very discouraged when no peppers appeared on my plants, although they appeared healthy in every way. I theorize that the heat we experienced this summer, with average daily temperatures above 100 degrees, prevented the flowers from setting fruit. I did notice during the past few months that the flowers would turn brown within a few days of appearing. I had almost given up on harvesting this year when suddenly, yesterday, I noticed about 15 or 20 small peppers. This has been the first week since June that average daily temperatures are below 100 degrees. In fact, our average daily temperatures for the last week have been around 85 degrees. I now believe that temperature, more than soil conditions, has affected my plants. I’m happy to finally see small peppers, but I’m afraid it may be too late in the season for them to fully mature. I’ll post more updates in the following weeks. Last week during a freeze warning I harvested most of my Aji Amarillos. I left a few on the plant and covered them with plastic. It was all for nothing since we did not get a freeze. But now I’m left with a bunch of green, yellow, and orange peppers in various ripeness stages. I left enough peppers on the plant, as seen below, and I’m hoping they’ll have enough time to ripen on the plant itself before the next freeze. For the last week, I’ve used the green peppers in various dishes and was pleasantly surprised to find that they were, indeed, HOT and full of flavor. So tomorrow I’m going to try several ways to preserve them. I plan to take all the green peppers, seed them and then blanch them before putting them in a food processor along with salt and olive oil, and turning it into a puree of sorts that I can then freeze. The orange and yellow peppers I’ll cut in half, seed and blanch, and freeze just like they are. I’ll post an update with my results. Like I mentioned in my last update (2011-11-12), I finally got around to preserving my peppers. I harvested any peppers that were still left on the plants that were over an inch in length. In the end, I decided to just process all the peppers in the food processor. This actually worked out pretty well, and I got a good blend of flavors from the peppers at various stages of ripeness. I took all the seeds from the orange (fully ripened) peppers and set them aside to dry for next year’s crop. I did however leave a bunch of peppers with the seeds in them, I’ll find out later whether this decision will prove to be a mistake or not. After cutting and seeding all the peppers, I quickly blanched them in hot water and set them aside in a colander to cool a bit before adding them to the food processor. I added salt and oil to the food processor, and when I got the consistency I wanted, I placed the sauce in 5 jars and 2 small ice cube trays, similar to the way I did with the pesto. These ice cube trays are small, about 1/2 inch square, the perfect size for adding to a bowl of soup, or a pot of stew. All in all, I think I processed somewhere between 150 to 200 peppers (keep in mind all these came from only two plants). I ended up with 2 small ice cube trays and 5 jars of the sauce, which hopefully will last a few months until next year’s growing season. I’m already planning for 6 plants next year. This is turning out to be an unusually warm fall season. During most years, by this date we have already had many days of sub-freezing temperatures. Heck, even the leaves on most of my trees are still green. I know this wonderful weather can’t last much longer, so since I still have quite a few peppers on the plants, I may process the rest next weekend. Aji panca is a purple chili pepper used as a spice in many Peruvian dishes. It’s prepared into a paste/sauce which is added to many different dishes, including beef stew, gizzo de pollo, spaghetti, papa rellena, lomo saltado. You’ll find this in the ingredients list for several of the recipes I’ll be posting on this blog. It can be stored for up to a month depending on how it’s prepared. My grandma does not add salt or oil to it, but I feel safer/better adding both, just for the preservative properties. You can also freeze it for later use. Although it’s not easily found in U.S. grocery stores, it can be ordered at Amazon. You can purchase it in a variety of ways: dried, powdered and paste forms. I was very surprised to see that it’s not too expensive. You can also find it on ebay in several different forms. If you buy the dried form, it can easily be turned into paste. I will update this post in the future with instructions on how to do that. Next year I plan to try growing aji panca from seed in my back yard. This is a blog about cooking and food photography. I’ve toyed with the idea of creating a blog for years now. I’ve always enjoyed cooking, although I never really got good at it. In fact, over the last few years I’ve been doing it less and less. I used to love experimenting with different spices and ingredients, and I’ve grown my own herbs and vegetables for several years now. I’m an unlikely cook, a computer programmer by training and a computer geek at heart. I just got back from a trip to Peru, where I got the chance to learn from my grandma about cooking Peruvian foods. This has renewed my interest in cooking and excited me about trying to duplicate those recipes here in the U.S. I want to use this blog as an archive of my kitchen experiments and the recipes I’ve gotten from family and friends. Not all my recipes will be “from scratch” — sometimes when I’m in a hurry, or just too lazy, I do use canned ingredients and already-mixed spices. I’m also a gadget freak, so I plan to write about the tools I’ll be using in my kitchen, like the ones used by my grandma. (Her gadgets aren’t high-tech like mine. She has a favorite rock to smash garlic and an even bigger rock to crush corn). I am a novice cook, photographer and blogger — but my goal is to improve in all these areas. For the last several years, the only real writing I’ve done is adding comments to my program code, and it was usually only for my future reference. So feel free to offer pointers about my writing style, along with your cooking ideas. I’d love to hear from you. If I’m lucky, I’ll inspire others to enjoy cooking as much as I do, and if I end up with some new friends along the way, then so much the better.